The upcoming crossover has a ton of ginchy homages. And we’ve only seen a few pages so far. When Lee and Mike Allred get their hands on something, they go in up to the shoulder. 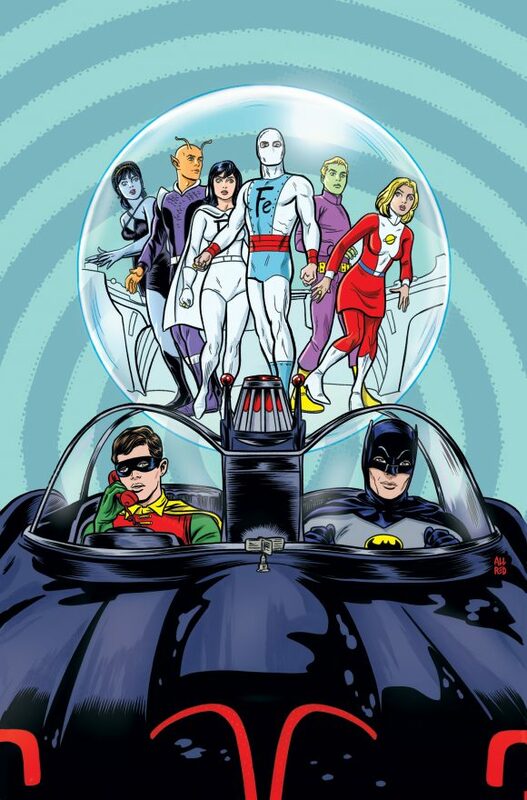 Take the upcoming Batman ’66 Meets the Legion of Super-Heroes crossover one-shot, for instance. (Click here for the details of that groovy project.) The unlettered preview pages and panels we’ve already shown off (click here and here) are chock full of Easter eggs that pay homage to both the Caped Crusader and the 30th century’s greatest teen heroes. How many are there? Lots. But here are 13 that I’ve identified. If you see any more, add them in the comments below or in whichever social-media thread you found this. Oh, and if you’re reading this, Lee and Mike, we want to hear from you too! The issue will be released digitally in June and in print in July. 1. This panel alone has five fun references. The Legion is in love with Robin. 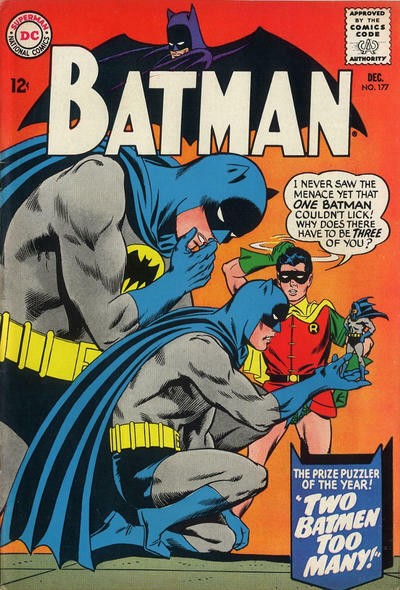 Clearly, the Boy Wonder is the one who’s the legend 1,000 years from now and they regale him with tales of his bizarre exploits, none of which “happened” the way they think. 4. 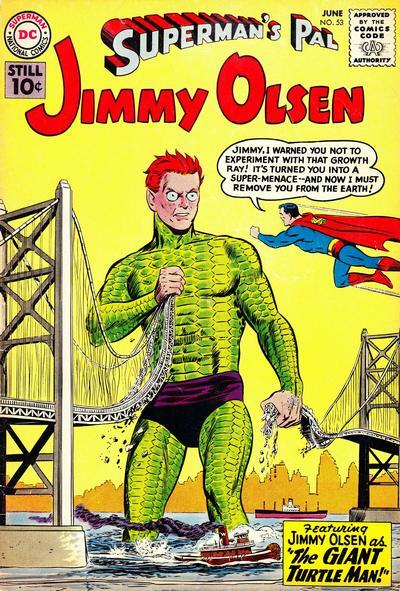 … and Giant Turtle Man Robin, based on Jimmy Olsen #53. 5. At least the Legionnaires got Owlman Robin right, even if they got the costume wrong, from Batman #107. 6. 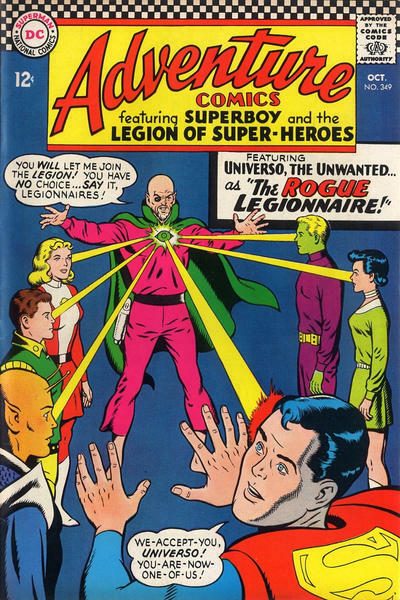 The Legion’s line-up is timed to when Batman ’66 was on the air. Biggest example? The inclusion of Ferro Lad, the great martyr of the Legion. Ferro Lad was introduced in Adventure Comics #346, cover-dated July 1966, which means he hit the stands only a couple months after Batman ’66’s debut. 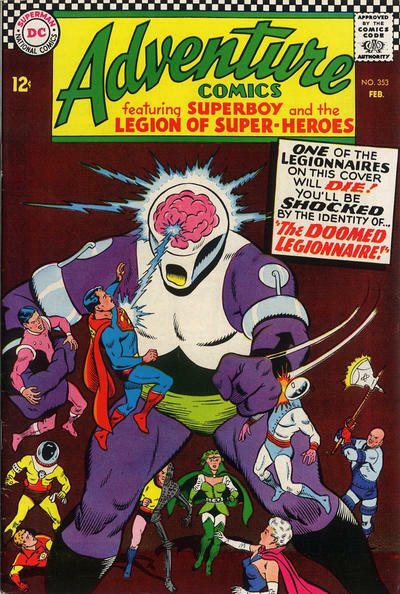 He died less than a year later, in Adventure Comics #353, cover-dated February 1967 — during Season 2 of the show. 7. There’s a lot on this page. For one thing, Legion villain Universo features prominently here. 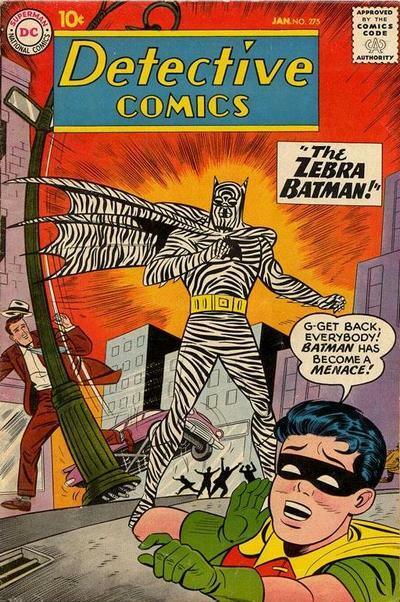 He debuted in Adventure Comics #349, cover-dated October 1966. Universo’s first appearance involved time shenanigans. 8. 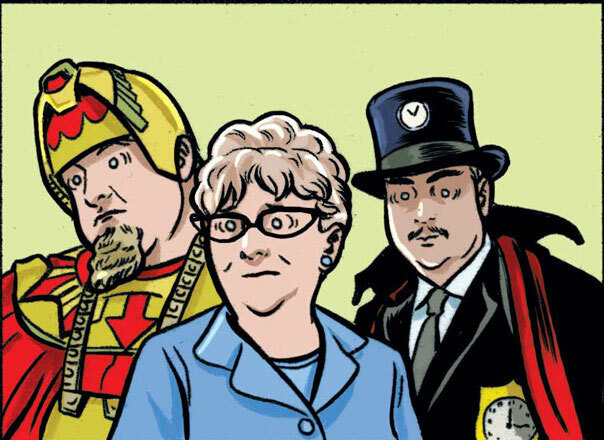 And if there are going to be Batman villains involved in a time-travel story, well Clock King has to make at least a cameo, doesn’t he? And King Tut, who thinks he’s the ancient Egyptian king incarnate, kinda makes sense too, right? The woman in the middle? Is that a version of Aunt Harriet that doesn’t use Madge Blake’s likeness? Someone online thought it might be Ma Parker. I’m going with the lovely Mrs. Cooper. 9. 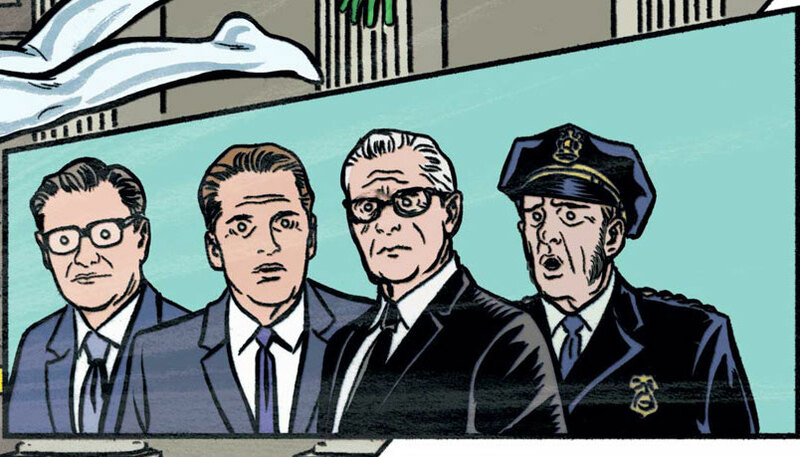 I also espy Mayor Linseed there, directly to the left of Commissioner Gordon and Chief O’Hara. UPDATED: Lee Allred contacted us to tell us that the man at the far left is Gov. Stonefellow (a.k.a. New York Gov. Nelson Rockefeller). 10. There’s also this panel from the DC All Access video from a couple days ago. (Click here.) Of course, Egghead, who is allegedly the smartest villain in the world, would be involved. Time travel isn’t for dummies, you know. And just check out those space-faring DC adventurers like Adam Strange on the far left and the Space Ranger, second from right. 11. We never get to see the trophy room on the TV show. 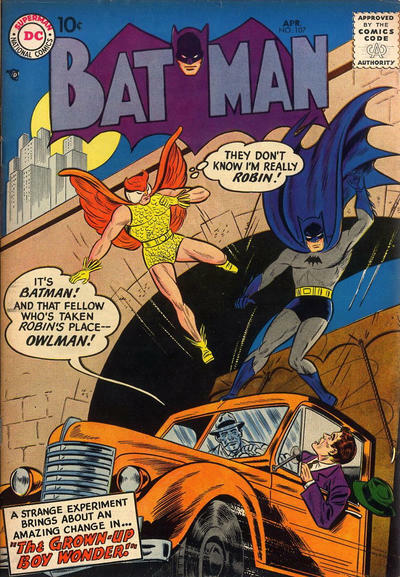 So it’s nice to see that Batman once had the comics’ classic roadster too. But with red Bat-emblems on the wheelcovers! 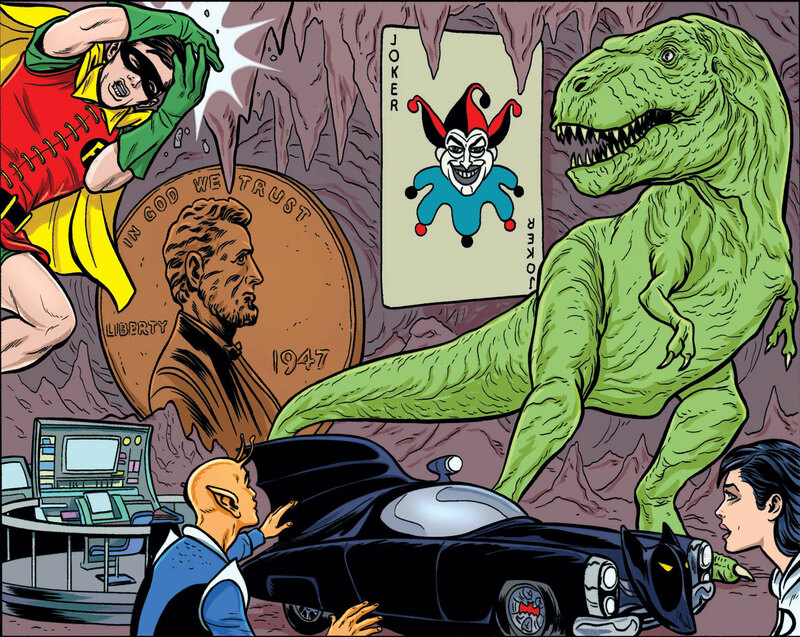 Jerry Robinson’s Joker calling card makes an appearance, as does the giant penny, with its classic printing date of 1947, and the T-Rex! 12. 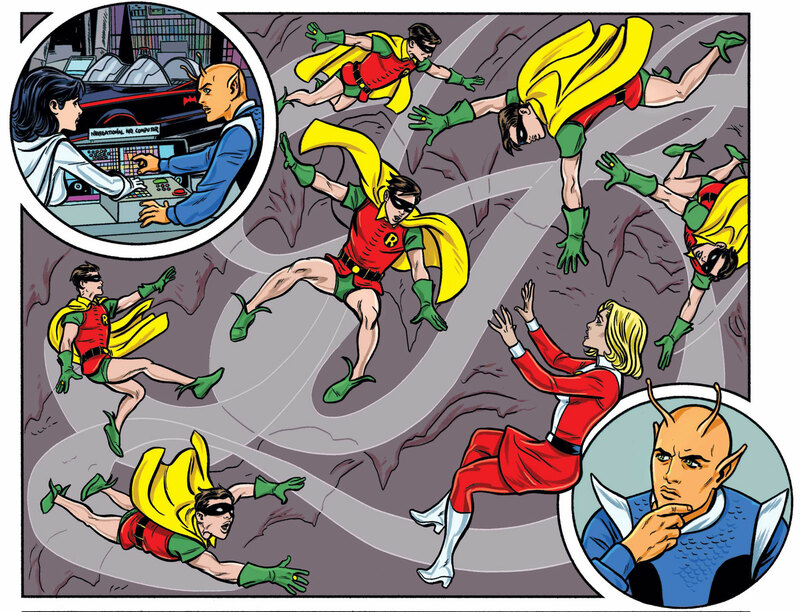 Batman gets his Legion flight ring and Robin has problems getting his under control. 13. Look! Up in that crowd! It’s a horse! And a dog! And a cat! And a chimp! It’s the Legion of Super-Pets! 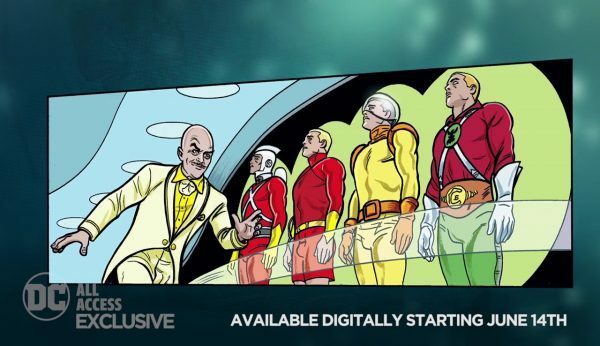 Does that mean Batman ’66 will finally meet a version of Superman? Or at least Superboy? Wanna see more pages and panels? Make sure you click here and here. And if you see any more Easter eggs, let us know! 9. To the left of Mayor Linseed, Governor Stonefellow. The guy to the left of Mayor Linseed looks like Nelson Rockefeller, namesake of “Gov. Stonefellow,” who was mentioned but never seen on the Batman TV series. Between Adam Strange and Space Ranger is Tommy Tomorrow of The Planeteers. 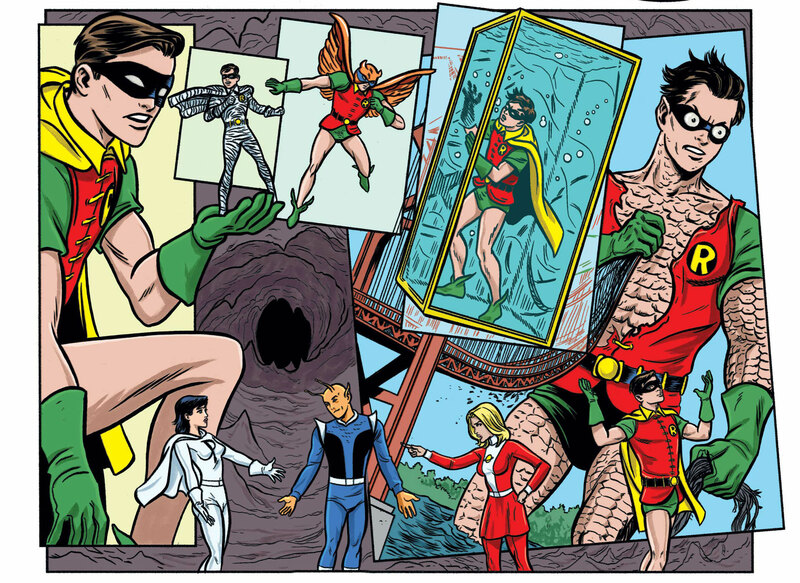 The trophy room also appeared in the ‘Batman 66: The Lost Episode’ comic featuring Two-Face. 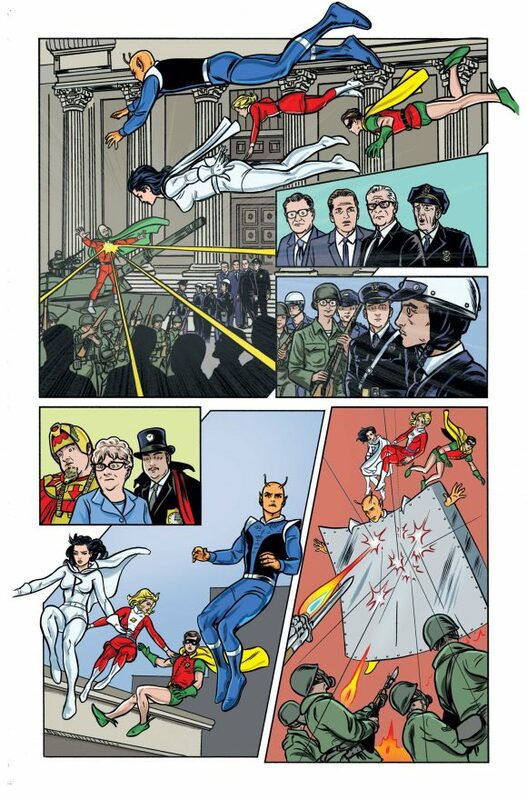 And Clark Kent (along Vicky Vale, Brit ‘Green Hornet’ Reid, Jack ‘The Creeper’ Ryder and a young photographer named ‘Peter’) made a cameo in the last chapter of the regular Batman ’66 book. The last statue in the panel with Egghead is the hero from the Knights of the Galaxy feature from the very early days of Mystery in Space, I believe. He’s miscolored to look more like Lex Luthor, however. Can’t wait for this!!! 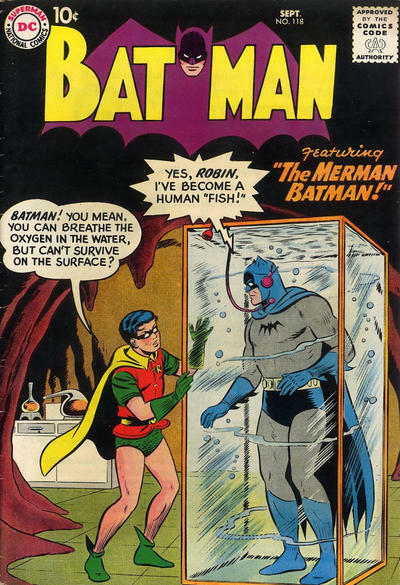 Batman ’66 #30 is one of my single favorite comic issues of all time. Continuity-wise, Shadow Lass was never on the team at the same time as Ferro Lad. He died in issue 353, she joined in 366, cover-dated March 1968 (and by that time, Lightning Lad had gotten his real arm back and lost the metal one).